Welcome to Turfsavers Tree Farm! Turfsavers Tree Farm has expanded their operation to include firewood sales. Seasoned mixed hardwood available by the cord. Can haul 2 cords at at time. Delivery available for an extra charge. Call, text or e-mail today to order your firewood! Local Belgium, WI Business with Generations of Experience. Thank you for considering Turfsavers Tree Farm for your Southeast Wisconsin tree sales, tree planting, tree moving, and landscaping needs. Our mission at here Turfsavers Tree Farm is to ensure that ALL of our customers are provided with outstanding trees and excellent service. We take pride in offering quality local service and a wide variety of trees for sale for you to choose from. They offer Ornamental Trees, Evergreen Trees, Shade Trees, and select shrubs. Turfsavers Tree Farm uses state of the art equipment that will not rut up your lawn like competitors do! Brian Strauss, the owner of Turfsavers Tree Farm, takes pride in his core values to maintain a safe, efficient, and excellent tree service. Brian is the second generation to own and operate this tree farm out of his grandfather's farm in Belgium, Wisconsin. By demand, the farm has expanded it's trees for sale. It has also gained experience in landscaping projects such as retaining walls, patios, walkways, and many tree planting design projects. We specialize in arranging your trees, so they are aesthetically pleasing and have the best chance for survival. Don't be fooled by Virtual Competitors, ALL of our trees for sale are on Site! Make sure you don't get fooled into buying a tree from a virtual tree farm! Turfsavers Tree Farm has over 5,000 trees on site, and over 500 trees for sale in the nursery for you to choose from! 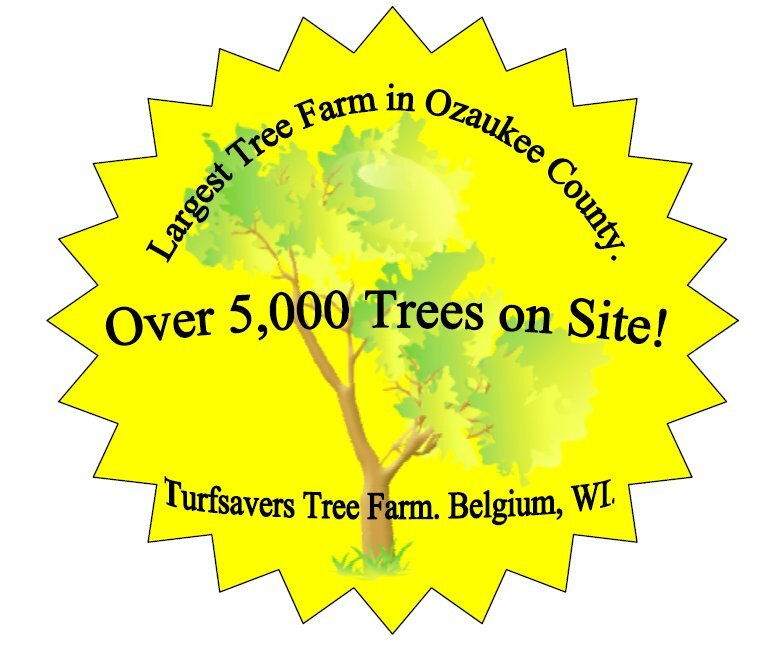 Turfsavers Tree Farm is one of the largest tree farms in Southeast Wisconsin! All of the trees for sale in our virtual tree farm selection are available for you to come and see, touch, and smell. Remember, you want to know what you are going to buy before you buy it! Turfsavers Tree Farm has many more trees for sale than the ones offered on the virtual tree farm. The trees for sale at Turfsavers Tree Farm are carefully raised for quality and health. There is a wide range of deciduous and coniferous trees for sale that you can chose from to accent your lawn or home. The trees for sale come in all shapes and sizes, so our years of experience at Turfsavers Tree Farm can aid you in your decision on which trees or landscape design to choose for your property. Choosing the right trees for the right location is key to a successful transplant. Brian will go through all of your options for your specific property type. Turfsavers Tree Farm also offers a full range of landscaping services and products. They are a one stop shop when it comes to landscaping and tree planting supplies. The website only gives a small list of items available through Turfsavers Tree Farm. All of the trees planted by Turfsavers Tree Farm come with a Warranty, to ensure that your new tree will thrive on your property through all four seasons. 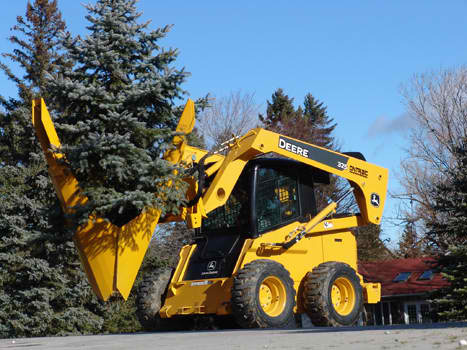 Turfsavers Tree Farm Services offer quality, efficiency, and satisfaction. Turfsavers Tree Farm is open by appointment ONLY! We pride ourselves in giving each customer individual attention, so please call in advance to schedule your visit. We are open 7-days a week, and do not charge extra for work done on the weekends. There are many options in buying new trees, so Turfsavers wants to make sure that you understand them completely before you make a purchase. Buying trees is a permanent addition to your yard. Turfsavers Tree Farm takes the time to ensure the best results when transplanting your new trees. The same goes for any landscaping needs. Turfsavers Tree Farm wants to make sure that you have plenty of options to chose from and have a professional finished product! We have confidence in the work we do, and you should too!! Turfsavers Tree Farm Nursery has over 5,000 Trees and over 500 trees for you to choose from! Turfsavers Tree Farm is a family owned business that takes pride in providing a wide tree selection and quality service! 7-days a week - No extra charge for weekend work! Please Call Ahead of Time to Schedule Your Visit!